My Peanut Butter & Jelly Popcorn recipe is a fun snack for your next family movie night — especially for kids that love PB&J sandwiches! 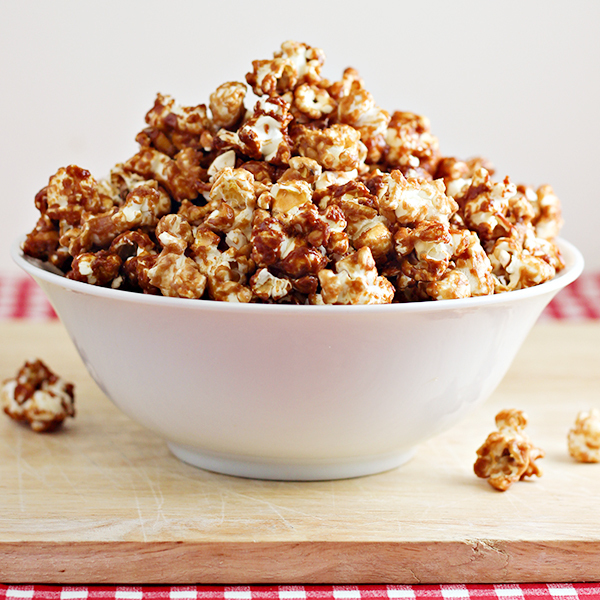 PIN this recipe to your POPCORN BOARD on PINTEREST! When I was a kid, my mom had lots of cookbooks and I loved looking through them. One of her cookbooks was devoted entirely to popcorn. 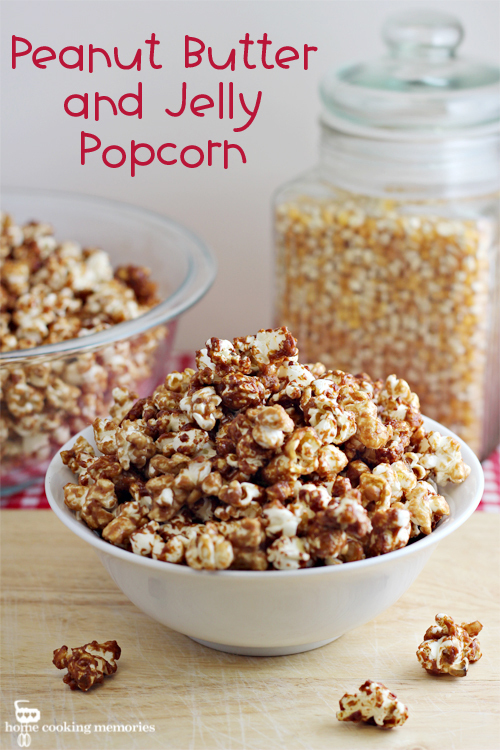 It has pretty much any kind of popcorn recipe you can think of, everything from savory to sweet. My brother and sisters and I had two favorites that my mom made from that popcorn cookbook. One was a sugar and spice popcorn, which I believe was a cinnamon sugar mixture sprinkled over buttered popcorn, and the other was a Peanut Butter & Jelly Popcorn. It was such a treat to have either one. A while back, I told my kids this story and they were eager for me to make Peanut Butter & Jelly Popcorn for them to enjoy during a movie night. I wasn’t 100% sure how it was made, but I gave it a shot and the kids gobbled it up. It’s went through a few slight tweaks over the years, and while this popcorn may not be exactly the same as what I had as a kid, this it’s seriously yummy stuff! 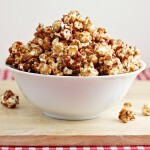 To make Peanut Butter and Jelly Popcorn, you will need to pop about 12 cups of popcorn (about 1/2 cup popcorn kernels). I make mine on the stove top, but you could also make it in a hot air popper, or even use microwaveable popcorn bags , if you wish. On the stove, you will heat and combine peanut butter with jelly. I used chunky peanut butter and also grape jelly, but you could use strawberry jelly or another variety. The popcorn is spread out on a large baking sheet (or two) and a bit of the mixture is drizzle over the popcorn. Combine the popcorn with the mixture and repeat with small amounts of the mixture until it’s all used up. 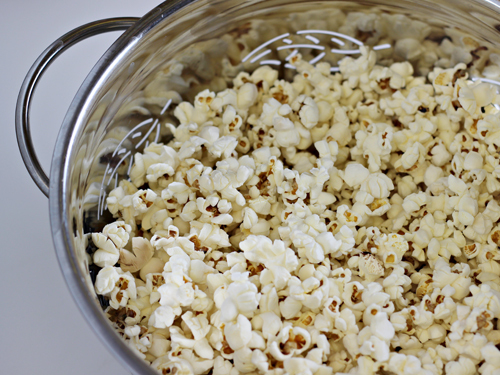 The popcorn is baked in the oven for about 30 minutes with stirring throughout the baking. Allow to cool and then serve! Kids love it and it’s great for movie nights and you can even package it up to give as a gift to someone. Heat oven to 200 degrees F. Line a baking sheet with parchment paper. Spray parchment paper with cooking spray. Spread out popcorn on baking sheet, you’ll want it pretty much in one layer, but it’s ok if it overlaps a bit. If necessary, use a second 2nd baking sheet. In a small saucepan, combine peanut butter, jelly and salt over medium heat, stirring constantly, until mixture begins to boil. Remove from heat. 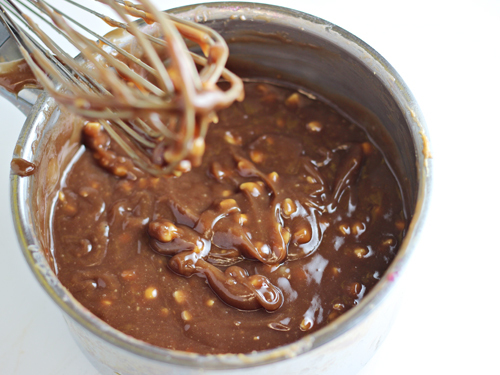 Drizzle some of mixture over popcorn and with a spoon or spatula, gently combine popcorn with mixture. 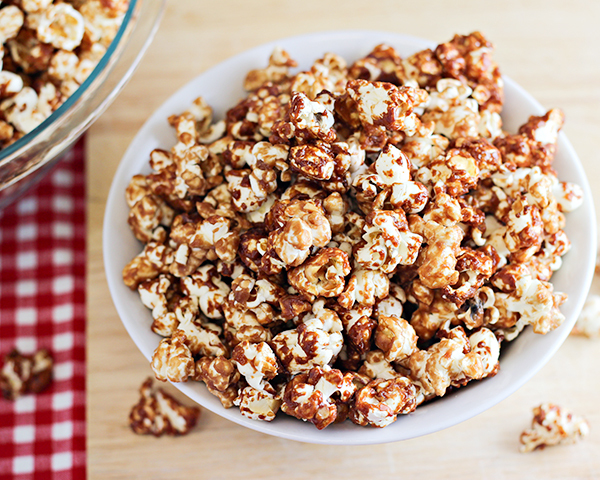 Continue to drizzle mixture over popcorn and combine them until all of the mixture has been used and pretty much all popcorn has coating. Spread mixture out again so it’s in one layer as much as possible. Bake for 30 minutes in the oven, stirring popcorn every 10 minutes. Remove from oven and allow to cool completely. Serve immediately or store in an airtight container. What a great idea for a popcorn snack. Thanks for sharing with us at Throwback Thursday! Pinned and shared! What a fun idea and it looks good! Thanks for sharing on the What’s for Dinner link up and don’t forget to leave a comment at the party – Next week’s features that also leave a comment get pinned and tweeted! Oh my word! This is droolworthy! I can only imagine the flavors until I make this recipe. Looks fabulous. Oh My Gosh, My Kids are going to Love this! I pinned this for later. 🙂 Thanks so much for sharing at the Create- Share- Inspire link party. We hope you will stop by again this evening. What a great combination. Thanks for sharing with us at Throwback Thursday. Can’t wait to see what you bring to the party this Thursday at 7:00. We make peanut butter popcorn sometimes that is similar to caramel corn, but using peanut butter in place of most of the butter. But I have never had peanut butter and jelly popcorn. Pinning to try for sure! This is a combination my whole family loves! 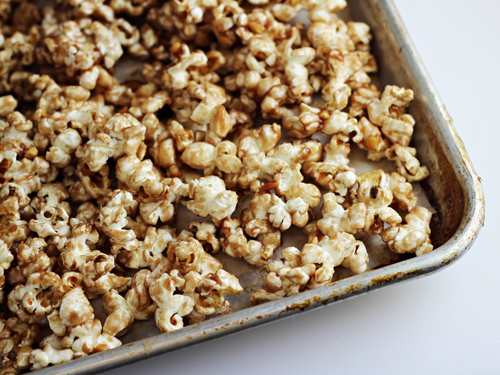 I would love to make this twist on sweet and salty popcorn! Omg, this sounds amazing!! I have must try this! This sounds like so much fun and perfect for our 4th of July picnic. Thanks for sharing at Inspire Us Thursday.